I've got the deck framed, and most of the deck boards down. I intentionally didn't give myself any allowance for scrap, so I'm about 2 boards short, plus whatever I'll need for the landing. The plan is a set of stairs (something like this, although I've got a perspective problem in my sketch). Because of not wanting to dig through more rocks and crap, the farthest post will be offset to the other side of the fence. There will be a door to the current screened porch in back, although probably not red. 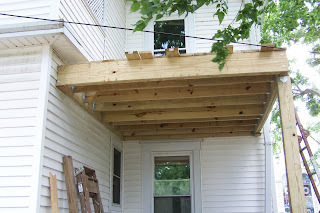 The current porch is eventually going to be enclosed to use as an eating area to compensate for the tiny kitchen. More archaeological finds--This chunk of slate is 30 by 42, by about 2-3 inches thick. I dug it up directly under where the landing will go, about 6 inches under ground. 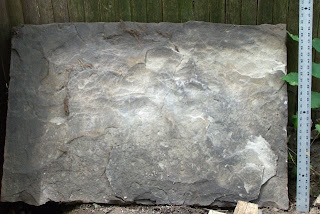 I dug up a piece of slate like that before. Some old guy told me they used to be used for property line markers. That is at least plausible, one edge was right at the fence line.